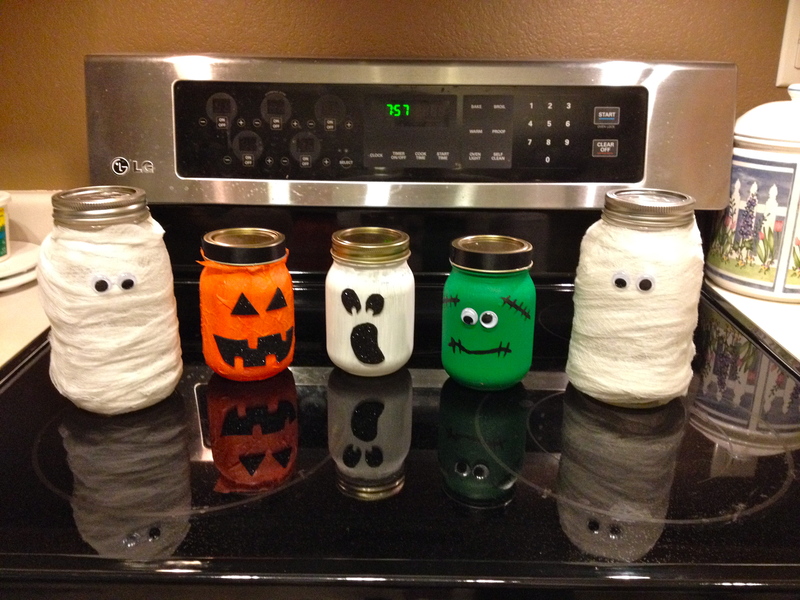 I have been browsing Pinterest for Halloween Decorations the last few weeks because I wanted to start collecting/making stuff for my own place to take with me when I move out and just to add to the house this year. My mom already has a ton of cute stuff, (I will be showing that in a few days). I came across plenty of “best halloween decorations” pins, and decided on a few things to make. Some will be for a Halloween party and some I will be making and showing through out the beginning of October. 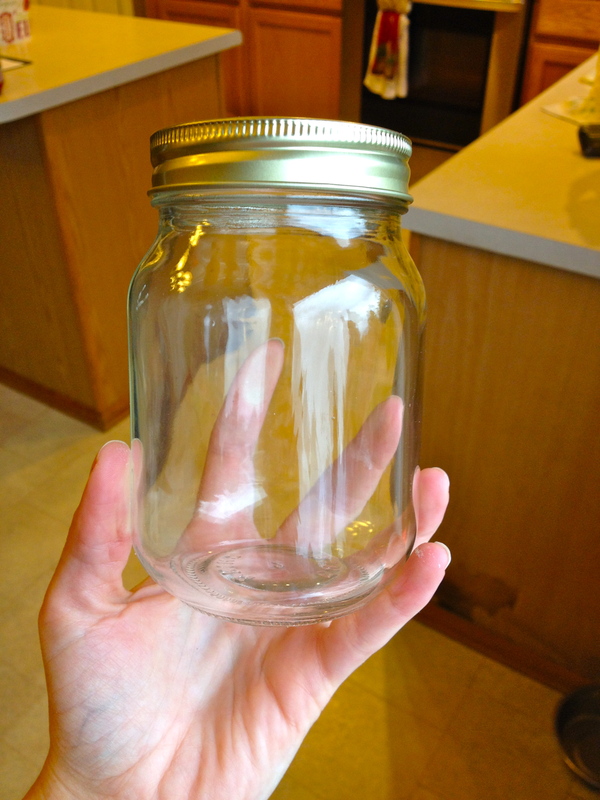 Here is the first, and for three cute jars (which can be used in MANY ways) I spent less then $10. Frankenstein- I used acrylic paint (green, brown, and black) to paint the jar and lid. It took two coats of each. Then I just glued on googly eyes and hot glued bolts on. Pumpkin- Used Mod Podge to glue orange tissue paper on. I cut strips out and then stuck them on, overlapping them a little. Katie brought this cool self-sticking black glitterly foam paper and we used it for the face. It cut easily with scissors. and lights off… the frankenstein is not as dark in person. Katie’s were SO cute too! she made a few more than me and I love how they turned out. I am totally jealous of her mummies! 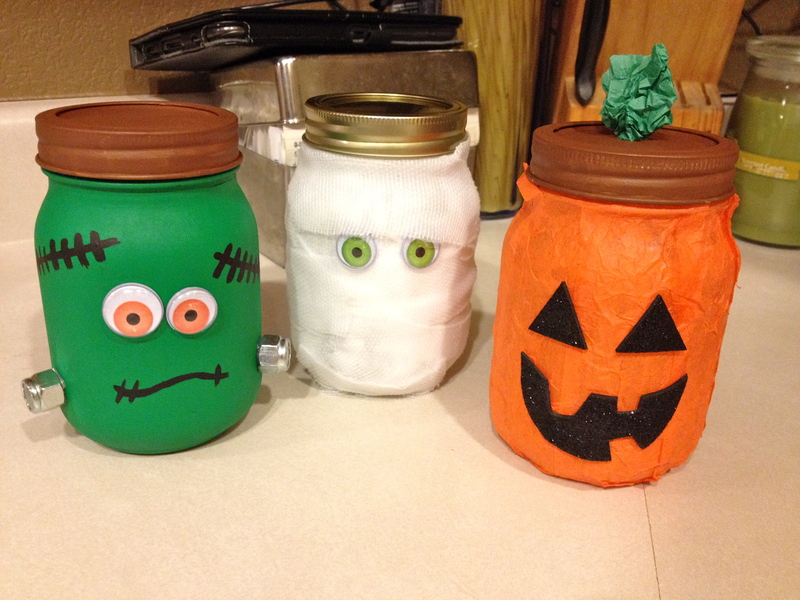 IF I had not had the product, this project would still have been under $20, which is not bad for three cute, customized Halloween decorations. ← Cake Pops | Halloween!! Yay! They turned out so cute! My Frankenstein turned out too dark for lights so I’m thinking about using it to hold candy instead!